There are slogans that tell how devout the driver is. You will be quickly undeceived! Some lorry slogans are social commentaries. There are warnings to rival drivers. And if other drivers can't take a subtle hint, there is outright intimidation. There are messages for the passengers. Some thoughts seem to be addressed to the world at large. And there are slogans that are a bit less universal. Some slogans may taunt envious rivals. Some lorry drivers wish to reassure friends and neighbours who may wonder at their success. A few slogans prove you don't have to be literate to be a slogan writer. 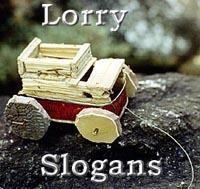 When the word "again" appears, it means the owner has bought a new lorry and recycled the original slogan. Even a truck needs love! Or does the slogan refer to the owner...or the driver...or the apprentices?